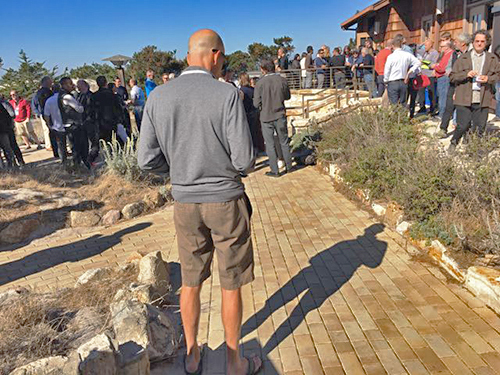 A correspondent from Mars visits the Monterey Design Conference. Who are these strange creatures called “architects”? 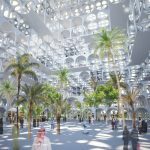 Architects possess a unique language and culture all their own – a purpose and a place in the world. Martians are mainly practical folk, of course, and while a barnacle might survive our 600-mph windstorms, a building with a hole cut through the middle might not. It was a totally different mind-set. So they sent me, the Venusian half-breed, to the Monterey Design Conference in Pacific Grove, CA to find out what they were missing. 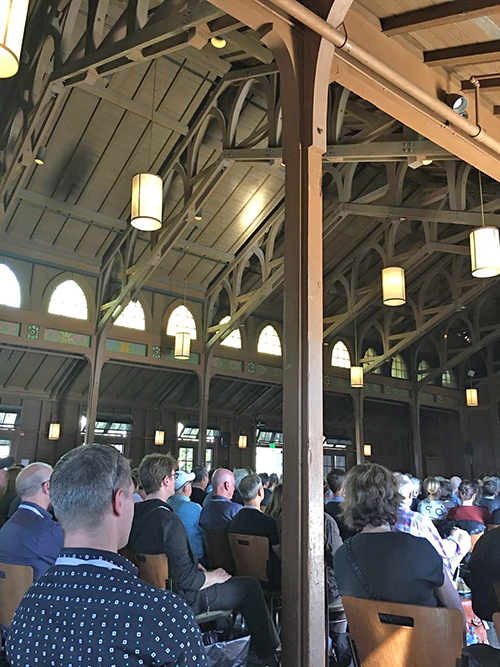 Headliners included, among others: Gere Kavanaugh; Sou Fujimoto; Dominique Jakob; Dorte Mandrup; Marion Weiss, FAIA; Michael A. Manfredi, FAIA; Jeff Goldstein, AIA; Shohei Shigematsu; and Julie Eizenberg, FAIA. Unlike a lot of industry conferences, this one was fun for civilians. 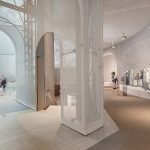 The architects were expected to attend the continuing education courses at 7am, but I just went to the design lectures – which were like going to a fascinating artist talk at a major museum, given by the artists themselves – a master class in design. 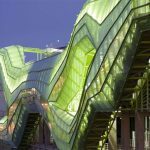 Part artist, part engineer, part risk-taking visionary, part project manager: of all professions, architecture combines so many other disciplines. Social engineering as well. Their tribal costumes reflect this. On the one hand, form-fitted black tailoring with round glasses. On the other, stealthy dashes of color (gray) and colorful socks that no one actually sees. It’s as if the flair beneath is repressed, buttoned-down, concealed, controlled – because high-value clients aren’t going to trust a $100M project to an unkempt counterculturist as readily as they will to someone wearing a suit. 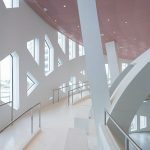 Some architects at the conference favored the “whitescape” design philosophy, while others celebrated color. 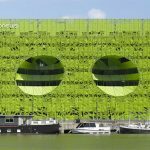 Left: Euro News Building in Lyon, France, designed by Jakob+Macfarlane. 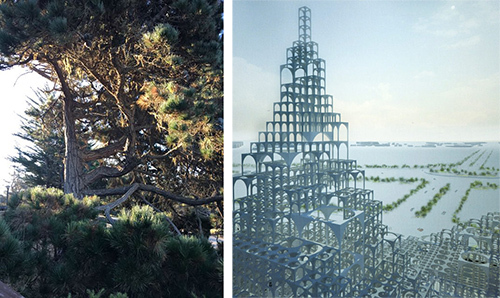 Right: N House by Sou Fujimoto. What about presenter quality? “Well of course, that goes without saying.” And quality there was. I found the speakers lucid, practical, and highly original. There was a diversity of viewpoint, of projects, of scale, and of design philosophy. Even untrained, I could appreciate the coherence of the designs, and felt a sense of place. 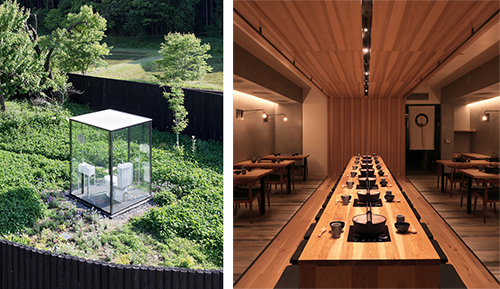 Left: Ichihara public toilet by Sou Fujimoto, a functional art piece that is at once the typical Modernist “glass box”, and also a perfectly private walled garden, carefully screened from view. 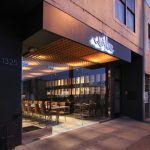 Right: Nabe restaurant in San Francisco, by Alan Tse together with Charles Chan Architectural Studio. 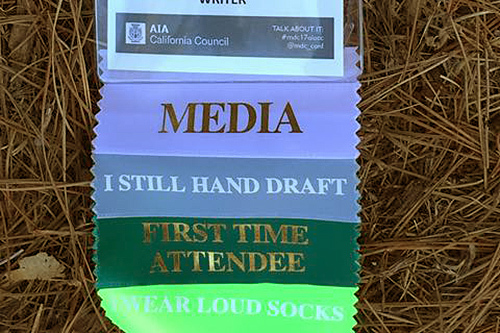 For those readers who aren’t architects, the designation “FAIA” means “Fellow of the American Institute of Architects”. It’s a highly coveted honor, bestowed by other architects, and only a handful of women have received it. The talks weren’t overly theoretical, based purely on incomprehensible jargon and fantasy renders. Although, there was some of that too. Quite a number of the projects were already in operation, tangible, “real”. Presenters mostly focused on recent works, so some were in the late design stages, with expected completion dates within the next year or two. The lectures had a storytelling aspect that gave them a broad intellectual appeal. 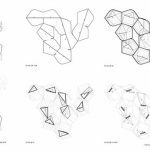 Presenters described their own work, usually 5-10 major built works, and described their process – how did they get there? What tools or methods did they rely on? Where did they get funding? 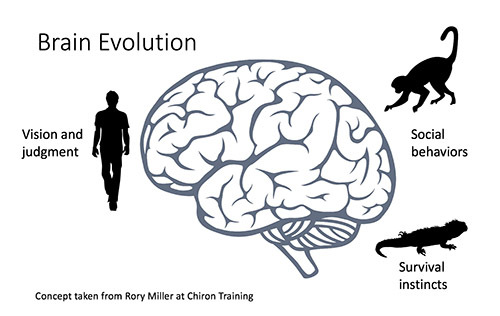 How did the project evolve as it went from concept to completion? There was a sense of friendly excitement and eagerness which conveyed itself to the participants through a general atmosphere of openness. A lot of the usual design-related standoffishness fell away in the small, intimate setting. A number of architecture students came, especially from schools like California Polytechnic State University in San Luis Obispo. The dining halls had large group tables and very set meal times, forcing people to talk to strangers. One of the most interesting events was a movie showing. Eero Saarinen was a Finnish-born architect whose actual career had been cut short by a sudden cancer. The movie was made by his son, David Saarinen – who was also present and spoke on a panel right after the movie. Another way the past connected to the present. No, Eero Saarinen was not at the conference. However, one of the presentations was actually a documentary movie about his life and work. This image shows the TWA terminal, which apparently sent the Modern architectural critics into fits at the time it was built. Why was it so interesting? Saarinen’s forms, freeform as they were, had been created through old-fashioned model-making techniques before the days of digital CAD and 3D modeling. Saarinen’s life was almost as interesting as his career. Architects want to build monumental works that will out-live them, so that both their works and their own name will go down in history. Other forms of permanence and immortality include the preservation and transmission of knowledge. Changing people THROUGH places. Sometimes, architects want to playing God, while others stand in awe of nature (aka “god” or “cosmos”). Are we mastering the world, or preserving it? There were so many exciting projects that I can’t even remember them all. Predominant themes included environmental responsiveness, sustainability, playfulness, community-building, and human interactivity. Emerging Talent talks were 15-minute slots interspersed between the main speakers, showcasing younger designers. 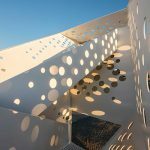 Connected House by Jakob+Macfarlane. This private residence had to overcome neighborhood opposition, including a neighbor’s lawsuit. Even in France, apparently, it happens. There’s an underground swimming pool beneath the flagstones. Matchbox by Digsau, in Philadelphia, a student facility. 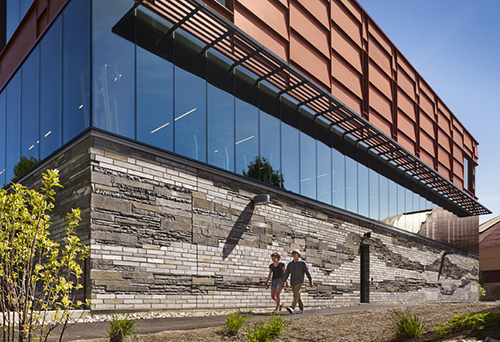 Note the stone facade near the base, a nod to Philadelphia local stone materials. Jeff Goldstein of Digsau spoke at length about a jobs training program. Here, 2 trainees are building a rain screen for their own workshop building. Delta Base Camp, by Digsau. This is a Boy Scout camp, mainly open to the outdoors, with gathering spots and sheltered areas. Detail of New Palmer Pittenger and Roberts Hall, by Digsau. 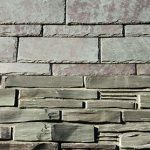 Jeff Goldstein was very interested in the details of stonework, using traditional materials in modern ways. ￼Dorte Mandrup from Denmark showed an ice fjord glacier observatory and a sailing tower, among other works. Ice Fjord Centre, by Dorte Mandrup. 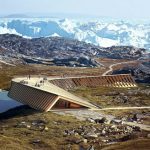 This glacier observatory, above the Arctic Circle in Greenland, had to address numerous environmental challenges including the world’s shortest building season and melting permafrost. 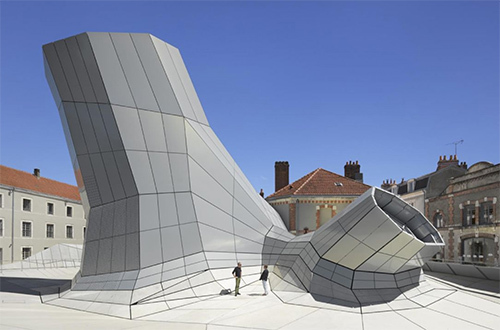 The shape morphs like a Mobius strip, with the walls becoming the roof and the roof leading off onto the ground. Ice Fjord Centre, by Dorte Mandrup, shown here in the summertime. The first day the sun rises in January is a village-wide festival. Sailing Tower, by Dorte Mandrup. This is also an observatory of sorts, with plenty of ways for visitors to climb and explore. 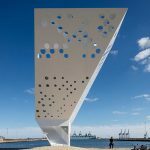 Sailing Tower, by Dorte Mandrup. 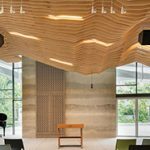 The interplay of light through perforations creates a playful, sculptural effect. 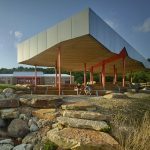 ￼Marion Weiss, FAIA and Michael Manfredi, FAIA of Weiss/Manfredi showed several outdoor parks and visitor centers. Their works were highly interactive with the outdoors, and they spoke at length about large-scale earthworks, water management, and other environmental necessities. 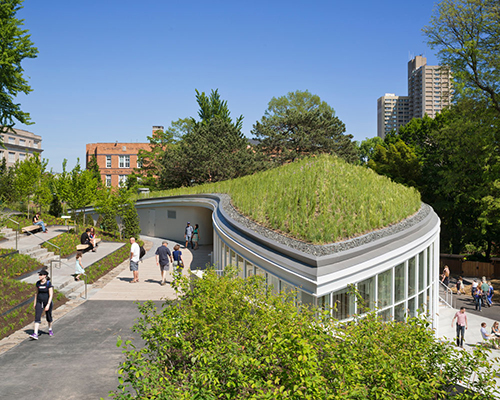 Brooklyn Botanic Garden Visitor Center in New York City, by Weiss/Manfredi. The smooth shape rises seamlessly out of the ground itself, and includes an all-season living roof. 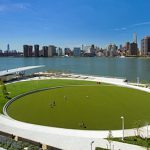 Hunter’s Point South Waterfront Park, by Weiss/Manfredi. This project featured extensive water management and flood control. Novartis Visitor Reception, by Weiss/Manfredi. 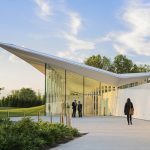 Although similar in function to the Brooklyn Botanic Gardent Visitor Center, this project incorporates security features that aren’t necessarily visible in photos. Seattle Art Museum Olympic Sculpture Park, by Weiss/Manfredi. 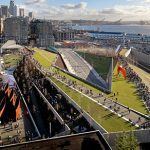 This was another extensive waterfront re-work, to showcase artworks against the heroic mountainous backdrop outside of Seattle. 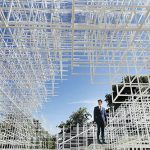 Serpentine Pavilion by Sou Fujimoto. 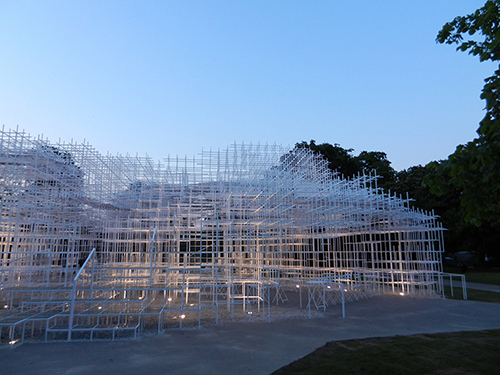 The latticework is meant to resemble cloud formations. 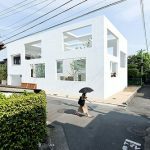 N House by Sou Fujimoto. 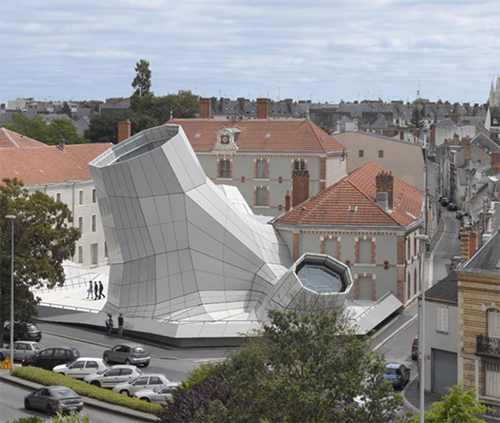 Several interlocking shells with overlapping openings create the sense of a livable sculpture. Souk Mirage by Sou Fujimoto, a proposed landmark for a Middle East city that presumably had a lot of funding to spend. ￼Shohei Shigematsu of OMA (Rem Koolhaas’ firm) described numerous large-scale projects at top speed. He also had a mix of theatricality and large work, including exhibition designs. Some of his larger buildings had holes or cutouts – I couldn’t identify them online, but they were pretty cool. 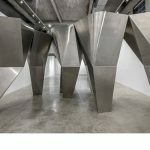 Pierre Lassoed Pavilion at the Musee de Beaux Arts in Quebec, by Shohei Shigematsu. 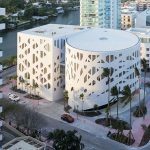 Miami Beach Cultural District Faena Forum, by Shohei Shigematsu. Miami Beach Cultural District Faena Forum, interior, by Shohei Shigematsu. The lower interior and performance space features a large dome shaped like a nautilus shell – all white, of course. 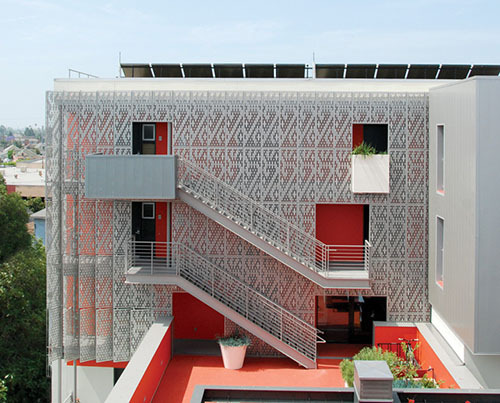 28th Street Apartments, an affordable housing project by KoningEizenberg Architecture. 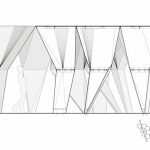 28th Street Apartments, by KoningEizenberg Architecture. 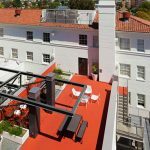 This adaptive re-use project was created from a historically significant YMCA building, with an addition in the rear. This view shows the original building in the front. 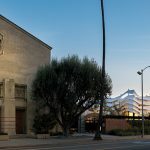 Temple Israel of Hollywood, a renovation and addition by KoningEizenberg Architecture. The addition is shown to the right in the photo. Interior of renovation/addition to Temple Israel of Hollywood, by KoningEizenberg Architecture. ￼Alan Tse’s “Emerging Talent” talk was refreshingly candid. He spoke openly about project flaws (like water leaks in a spa) and how he dealt with them quickly. He mostly showed restaurants and multifamily housing projects. His designs embodied an interesting sense of space and bringing the restaurant out to the street in order to draw people in. The projects shown here are two locations for Nabe, a sushi restaurant in San Francisco, CA. 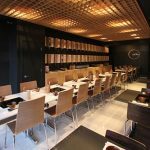 Second location of Nabe sushi restaurant, by Alan Tse. 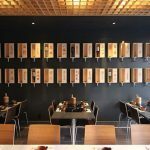 Nabe sushi restaurant by Alan Tse, together with Charles Chan Architectural Studio. The restaurant ceiling extends out to the street, with an entry designed to entice people inside. This entry also makes the street experience more pleasant. 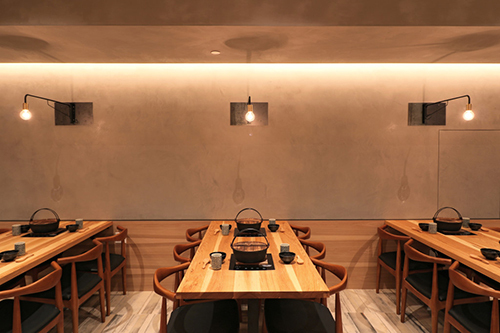 Nabe sushi restaurant by Alan Tse, together with Charles Chan Architectural Studio. En Pointe, Exhibition at the SCI-Arc Gallery, Los Angeles, California, by Heather Roberge of Murmur. The sculptures by themselves aren’t free-standing, which must have made the installation process a bit entertaining. 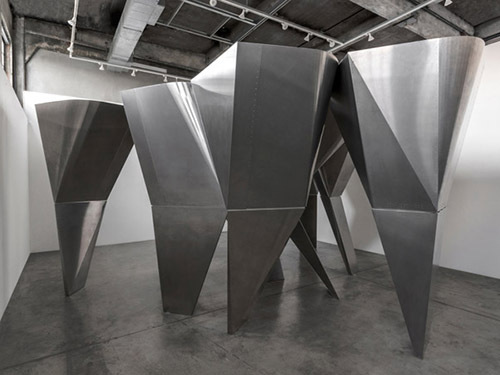 En Pointe, Exhibition at the SCI-Arc Gallery, Los Angeles, California, by Heather Roberge of Murmur. Although most of the projects were based in reality, there was a smattering of annoying post-modern theory. Talk freed from action means you can say any damn thing because none of it really matters. Talking about cool futuristic stuff is whole a lot easier than executing something. 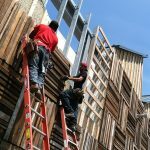 For one thing, you don’t have to convince financial backers to build your project if it stays exclusively on the computer. Execution means committing to one of many possibilities, which in turn means loss of the other possibilities, and likely a smaller first attempt than the earlier free-form flights of fancy. 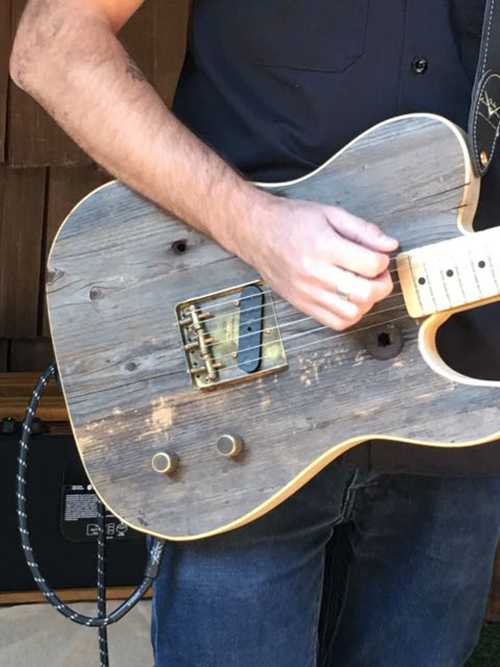 Prototyping, and failure, can be slow and agonizing. This can be very disappointing, and IMO is one of the hardest parts of “walking the walk”. In one case, an entire project seemed to consist of “talking about community” and visions for the redevelopment of a dilapidated waterfront pier in San Francisco that has so many entitlements that nobody – NOBODY – has ever been able to build there. It’s a lot safer to stick to community meetings and pop-up projects than it is to actually commit to something permanent, and make that happen. 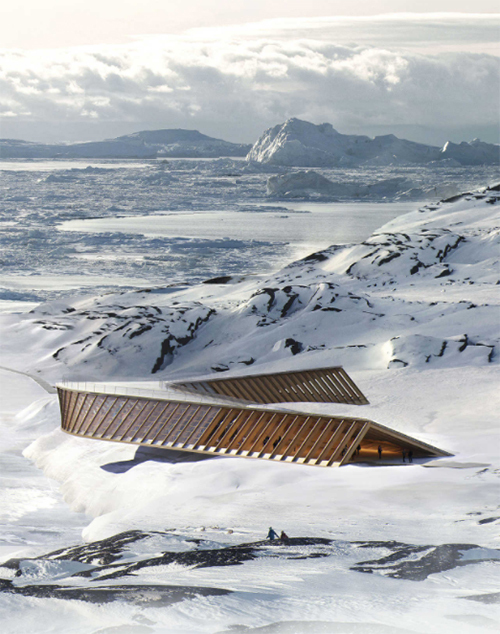 This conference underscored one aspect of architecture that is often overlooked: Nature. Of course, buildings are all connected to the ground in some way. A great building doesn’t just float in a vacuum. It interacts with, and alters, its surroundings. Beyond that, it alters the people who experience it, and this “experience” is something at once conceptual and immediate. 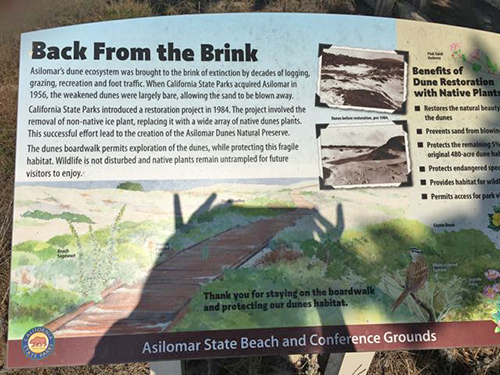 The site at Asilomar exemplified a type of extreme conservationism prevalent in CA and Southwestern states, where they’re so obsessed with habitat that you can’t even LOOK at a plant in case it gets frightened and disrupts a reproductive cycle somewheres. A lot of dead trees are left to decay because that’s natural, too. Dunes are very delicate and prone to erosion, so it’s not bad that they were so persnickety. A shadow from the Santa Rosa fires hung over the place. Everyone was worried. A lot of people had lost projects, or their clients were in danger of losing their homes. The environmental destruction was sobering. One thing nobody disagreed on: climate change is happening, it’s real, and architects have to express this urgency through better, more sustainable design. In fact, architects have a vital service to offer: rebuilding after natural disasters is not a theoretical exercise. It’s as immediate and practical as firefighting and emergency medical aid. 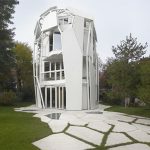 Several architects mentioned that they had preserved the plans for their clients, which would help not only with insurance but of course with rebuilding. This tangible aspect of the profession also reinforced an overall sense of mission and shared purpose. Natural setting has influence, and this conference was relatively small, around 900 people. Not a giant “industry convention” at a hotel. It was an intimate setting that immersed us all in nature, and a friendly nature at that. No sleet! Not too hot, no poisonous snakes. Many architects said it wasn’t as competitive as other venues, more sharing of ideas, more support. It seemed like a given than nobody there liked the Trump administration or any of the ignorance and cruelty that it stands for. Not just about climate change, but war and persecution. Normally one might expect a spectrum of progressive and conservative views, but not here. Ignorance impacts design, especially for public projects. A lot of Jakob+Macfarlane’s work in France would get bogged down in community process if you tried to build it in San Francisco. 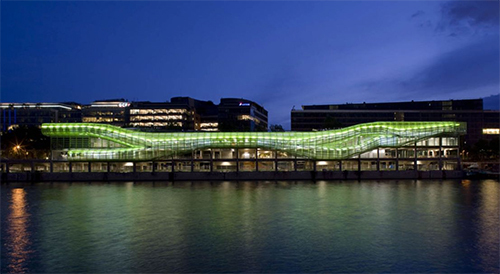 The Docks of Paris project by Jakob+Macfarlane exemplifies a type of civic boldness and taste that would be hard to replicate in the Bay Area. This project is a reclaimed old warehouse on the waterfront. Maybe San Francisco’s Pier 70 could take a few pointers, instead of blindly trying to preserve old corrugated shacks for “historic value”. 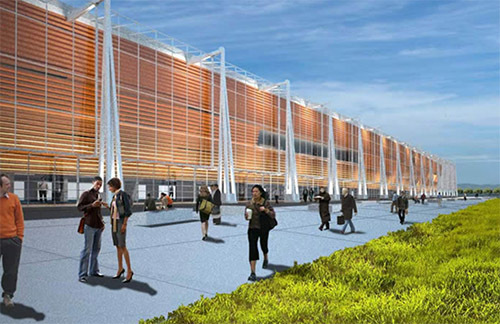 Image from a proposed master plan for Pier 70 from Bernardo Urquieta, AIA. 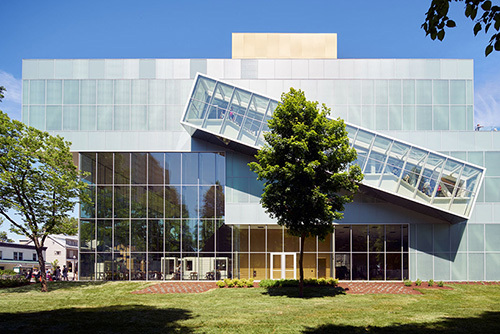 This project won an AIA Urban Design Honor Award in 2009. I was speculating with Mark about why it’s so hard to build anything, anywhere. We’ve written reams of articles about NIMBYism and how people will fight tooth and nail to preserve “existing neighborhood character”, even when that character is suboptimal. How can people who consider themselves “progressive” not see how they, personally, are contributing to the ever-worsening homeless problem by allowing market shortages in the hopes that “all those people will just go somewhere else” and leave them alone? Yeah, they’ll go someplace else… they’ll start living under bridges. Even Google engineers are living out of their cars. That’s sick. So… I finally figured it out. I got the answer out of a book by a law enforcement officer and self-defense expert named Rory Miller , titled Conflict Communication. So… this is why corporations form “diversity committees” that talk about change but actually work to preserve the status quo. And this is also why neighborhoods resist change, even when that change could be for the better, and could benefit them as well as any newcomers. I riffed the title of this article from a book of travel essays by Paul Bowles, written in 1963. That title in turn is from a 19th century poem by Edward Lear, also a travel essay of sorts.